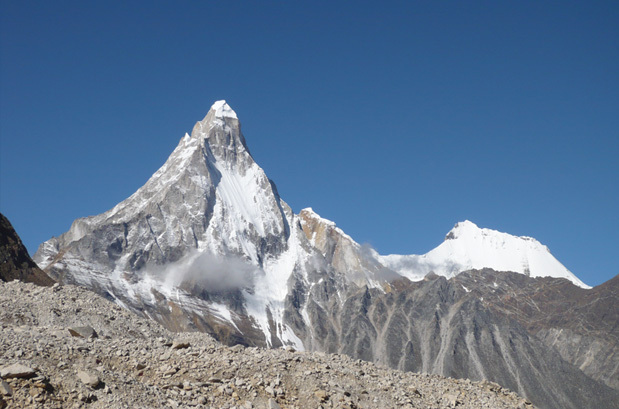 One of the sacred peaks in the Garhwal Himalayan region, the Shivling Peak looms at an elevation of 6543 meters, which is close to the snout of the Gangotri Glacier. According to the Hindu myth, the peak divinely symbolizes Lord Shiva's Shiva Linga. The massif overlooks the sprawling meadow of Tapovan at 4,463 meters, which is considered as one of the alpine meadows in India and is crisscrossed by several small streams and dotted with flowering plants. 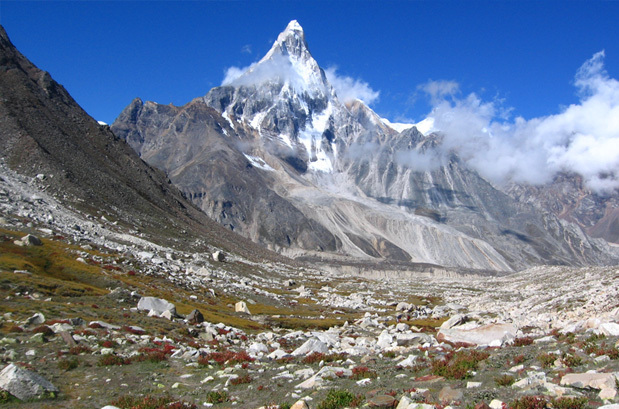 The first ascent to the Shivling peak was done by the Indo - Tibetan Border Police in the year 1974 and thereafter several routes were discovered by other expeditors. 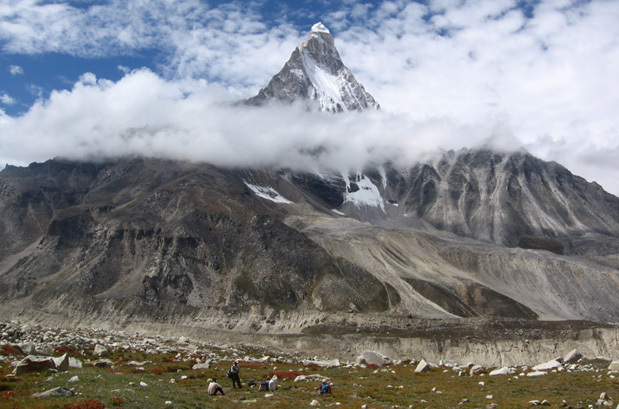 Trekking to the base of Shivling has always been a grapevine to the trekkers Shivling Trek who covered it. The trail being one of the challenging treks in the Indian Himalayan belt in the Garhwal region of Uttarakhand, one needs serious acclimatization at different altitudes. It encounters several steep gradients along with rocky, snaky and crazy paths. Throughout the trek that goes beyond the source of River Bhagirathi (mouth of Gangotri Glacier), Gaumukh at 4,100 meters approximately, to Tapovan, which is one of the Hindu pilgrimage sites in India, one needs to tackle some offbeat and boulder ridden ramps, cutting through narrow ridges and deadly cliffs. Nonetheless, the peaks like Hanuman Tibba at 5,370 meters, Bhrigu Parbat at 6,000 meters, Bhagirathi I, II and III at 6,856 meters, 6,512 meters, and 6,454 meters respectively and Mt. 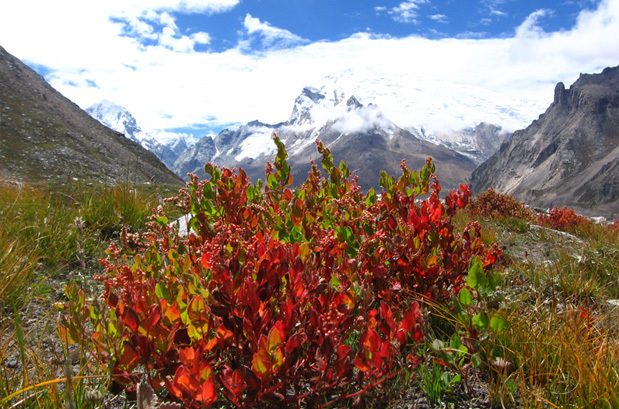 Meru at 6,400 meters are the major attractions after reaching different altitudes. 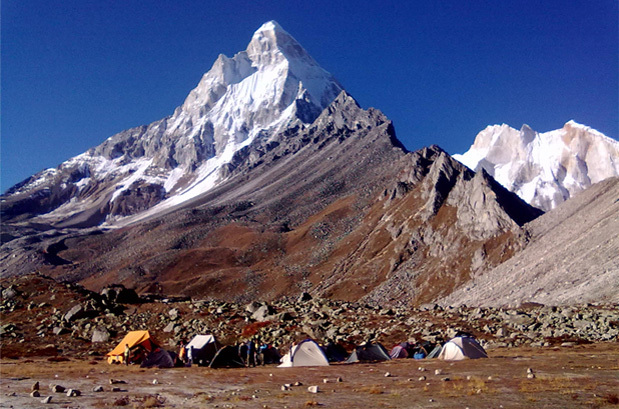 The trek to the Shivling Base Camp commences from Gangotri at 3,048 meters, a popular Hindu pilgrimage site and one of the sites of the renowned Char Dham Yatra. From Gangotri the journey by foot head towards Bhojwassa at 3,350 meters that passes through a thick pine grove along the gushing river Bhagirathi. From Bhojwassa the trek continues uphill to Gaumukh, which is one of the popular alpines for the Rishis / Sadhus to meditate. Thereafter, the trail turns to Tapovan, a picture perfect location, having an untouched surrounding. From Tapovan the journey goes ahead to the base of Mt. Kedardome at 6,850 meters and Kirti Bamak at 6,500 meters, to the glaciated bed of Kirti Bamak. The alpine tour also leads to the foot of Mt. Meru, which is another thrilling journey over the shifting moraine. From Tapovan the trail continues to Nandanvan at 4,570 meters, from Nandanvan one can easily trail up to Vasuki Tal at 4,800 meters, which is one of the high altitude lakes in the Indian Himalayan region. The downhill trek from Nandanvan heads to Bhojwassa and leads off at Gangotri and thereafter wheels to Haridwar via Uttarkashi. The beautiful and serene lake located in Gaumukh, Vasuki Tal and Gaumukh; considered as the Bhagirathi river's source. It is also considered as the origin place of River Ganga. Enjoying breathtaking views of the Gangotri Glacier and traversing through its treacherous passes; passing through the Chaturangi glacier, also close to the Gangotri Glacier and considered as one of the major shrines in the country for the Hindus. If you're planning to take a trip to Shivling Base Camp Trek during Summers then consider going between May and June, however, if your plan is to visit the place some other time then you should think about doing so between September and October, when Monsoon has passed. In Summer: Gomukh Tapovan has a weather that's largely suitable and pleasant in Summer time. Although, it's advised that you take along woolen clothes, just in case. The magnificent glory of the Himalayas teamed the feel-good coolness of the wind are set to take your breath away. In Monsoon: Gomukh Tapovan has a lot to offer in terms of its impressively-generous greenery adorned by raindrops along with its snow-clad mountains at the time of Monsson. You might find hurdles of road-blockage owing to the rains-caused landslides though, also, it's recommended that you pack along raincoats. Nonetheless, the picturesque appeal of the place is an experience you must take/have. After Monsoon: Gomukh Tapovan becomes even more gorgeous once Monsoon has passed. The few rain-related hassles are gone and the place is transformed even more beautifully, with its serene, lush greenery and colossal mountains looking all bathed and well groomed. Travelling with thick woolens is strongly recommended as the place gets chilly and perishing after rains. Shivling is actually a twin-mountain pinnacle, perched high at the altitude of 6543m, near the Gangotri Glacier, in the beautiful state of Uttarakhand-the North of India. Tucked away in the Garhwal part of the region, it's one of the most-popular, bucket-list destinations for trekking-enthusiasts. At our company, we provide exciting and thrilling trekking trips to this marvelous spot for adventure zealots and ardent dare-devils. Our Shivling trekking itinerary involves a fun-filled tour through Tapovan, a sacred pilgrimage centre, between Gaumukh and Shivling. 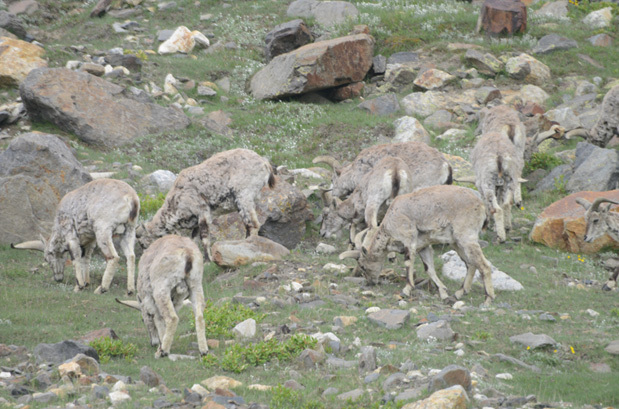 Making your way through spectacular glaciers like- Kirti Bamak and Meru, among other stunning glaciers, you'll have the good fortune of beholding the enchanting beauty of the gigantic Himalayan Mountains and spotting 'Ibex', the Himalayan goat. And if good luck keeps with you, you can also catch a rare sight of the 'Snow-Leopard'. Vasuki Tal is another beautiful point that you will be visiting during your trek, from here can be approached another extremely sough-after spiritual destination- Badrinath, for which many glaciers have to be crossed- a tour that only an expert mountaineer can take. Air-borne Route: The airport closest to Gangotri is, Jolly Grant Airport that's around 290Kms away from it. The airport has a good connectivity with Delhi, facilitating flights every-day. Also, the way from the airport to Gangotri is pretty conducive to travelling by automobiles. In case it's affordable for you, you have the facility of chopper at your disposal here. Railway-Travel/Route: At a distance of around 280Kms in Rishikesh away from Gangotri, is where the railway station is located on NH58 that happens to be the closest from Gangotri. The advantage is that many buses and cab services can be availed of from Rishikesh, Uttarkashi, Tehri Garhwal, among other places, towards Gangotri. The tour starts with catching a morning train from Delhi to Haridwar at 6.50 a.m. 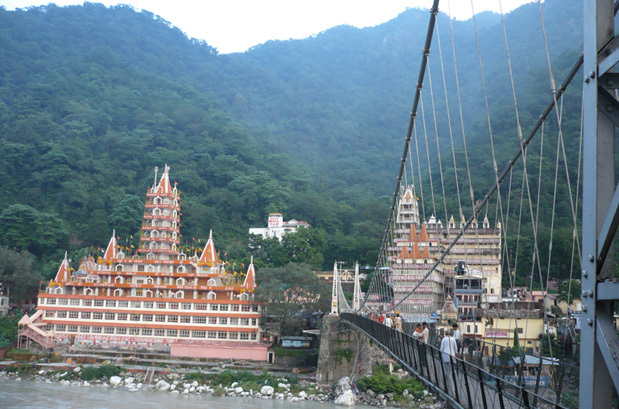 Upon reaching Haridwar, our trekking guide accompanies you to Rishikesh, where you are taken to your hotel accommodation to stay for the night. You can enjoy a relaxing time here before proceeding. From your accommodation in Rishikesh, you move ahead to Uttarkashi through Chamba. While on your way, you can gaze at the wonderful mountains of the Himalayas in Garhwal. Upon reaching Uttarkashi, you can go for sight-seeing, to enjoy the scenic beauty of this lovely place, before you retire to bed at your comfortable accommodation in the night. Once you've had your breakfast in Uttarkashi, you are driven to Gangotri through the gorgeous Harsil Valley. While you're on your way to this destination, you come across the amazing Sulphur springs at the beautiful spot called Gangnani. You can take a halt for gazing or clicking pictures of this awesome place or, take a refreshing dip in the water here. Once reached Gangotri, you have all the evening to yourself for exploring the place or unwinding at your hotel room, whatever you prefer. This heavenly beautiful place has so much to offer that you just can't simply stay a night here and leave. The forth-day is utilized for seeing the place around and enjoying the serenity of this spiritual centre. This is the place where your trek begins, you are guided while trekking through the wondrous forest of pine trees, leading you to Bhojwasa and Bhagirathi. It's a 14km pathway that takes around 4 to 5 hours of a leisure-paced trekking. This also happens to be the spot for your first camping of the trip, promising lots of fun and excitement. 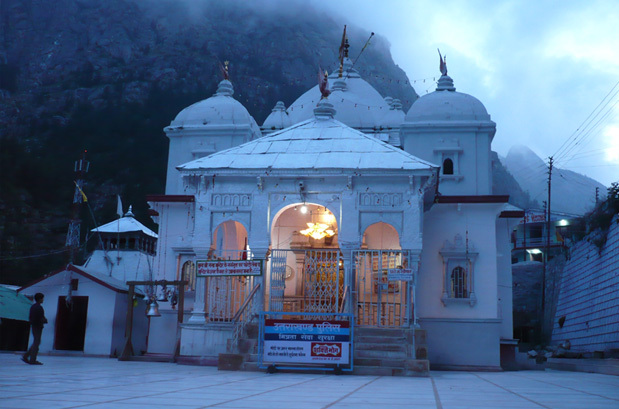 This day begins with your travel to Gomukh, the source of the sacred Ganges. You can enjoy the spectacular sight of the Ganges here flanked by wonderful greenery. Thereafter, you are guided in trekking downwards to Tapovan that happens to be the base camp of the phenomenal Shivling pinnacle. You also get to the pleasure of camping at this amazing place. Since this one's a strikingly beautiful place, exploring some of its glorious spots is a must. You are led to the stunning glacier of Kirti Bamak to be able to appreciate its glory whole-heartedly. You camp for one more night here. On this day, you get set to start for the Meru Mountain that promises to take your breath away with its bewitching beauty and serenity. You get to watch in peace the astounding beauty of Tapovan while you're on this short trip and stay one more night, camping here. You are led through Gomukh Glacier in order to reach Nandanvan where you trek upward to the meadow, enjoying the fun of trekking in one of the most-gorgeous places, taking in all the bliss of its natural beauty, before you climb back downwards. You sleep in the peacefulness of this place in your camps for this night. You begin your trek through Chaturangi Glacier in the early hours of the day to arrive at Vasuki Tal, enjoying the rocky and steep thrilling path all along. After having accomplished your trek in the stupendous beauty of this spot, you go back to relax for the night in your camps. You begin early on this day to fully enjoy your fun trek downwards, to reach Bhojbasa, gazing at the generous beauty of the giant mountains here. Once you've arrived the spot, you erect your camps to unwind in the tranquility here. 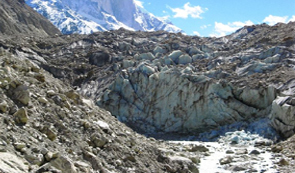 On this day of your tour, you trek downwards, following your trek-guide, to Gangotri, from where you are then transported to Uttarkashi by car. At Uttarkashi you stay for the night at your hotel-room. After having completed your trekking tour successfully, safely and enjoyably, you are driven down to Haridwar from where you board a train back to Delhi around 6 in the evening. The AC train you're onboard, drops you at the Delhi station around 10.45 in the evening. And with this, your trekking trip with us gets accomplished. When you should make the advance booking for the Tour ? 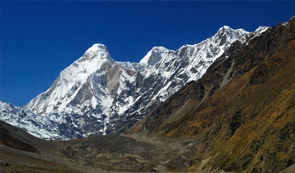 It's recommended that you register yourself for the Trek tour to Shivling Base Camp at least 2 months before it is to commence. This gives you the kind of time you'd need to make your own preparations for the excitement-filled trip. About carrying your luggage ? You needn't worry about your luggage being carried as the porters accompanying you on the treks would do the job for you. However, you can keep a small and handy bag with yourself for your own convenience with certain personal things. 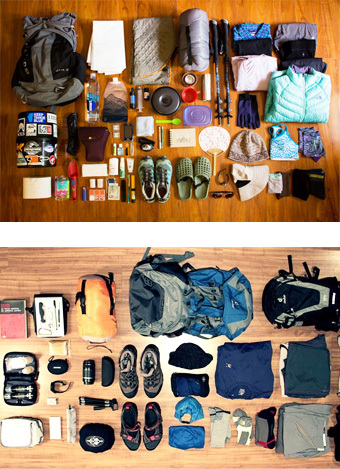 The ideal weight of your backpack ? After the booking is done, you are informed through a list, about the things you can carry with yourself during your trek. The ideal weight of your bag should be not more than 12Kgs. You are picked up from and dropped at the New Delhi Railway Station for the entire trip. We send you the tickets once confirmed. Once you reach Haridwar, you meet your trek guide who accompanies you there onwards. How the trek is conducted ? 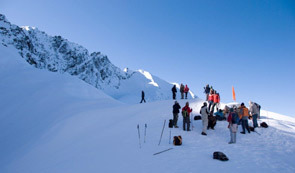 We provide you a professional and well-trained trek leader who guides you throughout your treks. Including males and females, we take no more than 15 trekking enthusiasts in one group to ensure convenience and safety for all. As the roads to the Himalayan Trek-path are bumpy and ramshackle on various stretches, using sturdy, dependable and safe vehicles becomes customary/mandatory. Hence, we employ cars like- Scorpio, Mahindra Bolero, Tata Sumo, Max, Tempo Traveller and others. Once the trip has been confirmed and a set date, sent to the trekkers, it remains unchanged and the trip is commenced at the appointed time, no matter how many trekkers turn up for the trip finally. You are assured that all our trekking guides are professionally trained with the requisite knowledge and skills of trekking & mountaineering. They are well-equipped with the basic emergency-treatment, medical kit, and are well capable of providing first aid in case of minor mishaps and injuries, to keep you safe. However, in case of a serious accident requiring a professional rescue operation, the cost will be levied on the trekker. Once you register yourself for the trekking-activity/trip with us, we furnish you with the details on advance booking for the same. Since the trek-path isn't easy, rather has some possible dangers, you are forewarned and particularly/strongly advised to first get your medical fitness checked by a qualified doctor, just so you are well-prepared and well-armed for the trip. It's imperative that such safety measures are taken before heading for the trip, as it involves climbing to altitudes as high as 14000 feet that not everyone can handle. Therefore, it's made amply clear to you well in advance that your decision of coming to the trek would be of your own volition and we take no personal responsibility for any unforeseen and unavoidable circumstances. However, the basic assistance of hotel-accommodation booking and transport services will be provided to you from our end. You are also requested and advised to read the 'Cancellation Policy' carefully before you book your trip with us. In case the trip is cancelled, owing to some unavoidable reasons that are out of the hands of TMI, no refund is guaranteed/promised. Nevertheless, we shall try to offer you some other trek in exchange for your advance payment.